CGBSE 10th Result 2019 declaration date is being sought after thousands of students who have appeared for the Board exam this year. If you are also one of them, you have come to the right spot. As per the latest reports coming from the CGBSE office, the Chhattisgarh Board of Secondary Education (CGBSE) has already begun preparation for the declaration of Chhattisgarh Board 10th Result 2019. The official notification detailing the CG Board 10th Result declaration date and other details is also expected soon from the CG Board. If academic experts are to be believed, the CG Board will announce the Class 10 Results on time, as per the annual academic calendar being followed by them. Jagranjosh has been ardently keeping track of the latest updates for the CGBSE 10th Result 2019 and all the latest updates are available here. For more information on CGBSE Class 10 Result 2019 can be found below. According to the latest buzz, the Chhattisgarh Board has already begun the preliminary preparations for the announcement of CGBSE 10th Result 2019. In all likelihood, the Chhattisgarh Board 10th Result 2019 will be declared as per the annual academic calendar of the CG Board, which puts the tentative date in the First week of May 2019. This year, the CGBSE 10th Board Exam was held from 1st March to 23rd March 2019. This is also in accordance with the general academic calendar of the Board as well as similar to the exam dates of last year. The CG Board generally takes about a month’s time to complete the evaluation process of the answer sheets. Therefore, students can expect the CG Board 10th Result 2019 to be out by first week of May 2019. Experts tend to consider the previous year CGBSE result dates, to give a tentative date for the declaration of CG Board 10th Result 2019. Going by the last year’s trend as well, the May First week looks very promising as far as the declaration of CGBSE 10th Result 2019 is concerned. Students can find the latest updates on CGBSE 10th Result 2019 right on Jagranjosh CSBSE Result 2019 page. Jagranjosh will soon provide the detailed information on the exact date of CGBSE 10th Result 2019, once it has been officially declared. CGBSE 10th Examination 2019 is probably the first competitive exam that the class 10 students have participated in their academic pursuits until now. A good score in CGBSE 10th Result 2019 will give the required boost to their confidence, to face future competitive examinations. Therefore, a bit of nervousness and excitement prior to the declaration of CGBSE Result is natural.However, looking at the previous year statics can be used to gauge the progress in the CG Board 10th Result 2019 over the years. To help students do so, we have provided the key statistics from last year’s CGBSE 10th Result 2019 below. CGBSE Class 10 Results 2019 are expected soon. However, on the result day, students who are waiting the outcome of their hard work will be overwhelmed with emotions. In this emotional state, they might commit mistakes while checking their CG Board 10th Result 2019. Considering the difficulties students might face while searching for their CGBSE 10th Result 2019, Jagranjosh has provided the list of step by step instructions on to download CG Board 10th Result 2019. The lists of instructions guiding students to download their CG Board 10th Result 2019 are listed below. If candidates find the official website to be slow and sluggish, they can alternatively check their CGBSE 10th Result 2019 on this page. Students will also be able to download their CG Board 10th Result 2019 scorecard from here. CGBSE will publish the Chhattisgarh Board 10th Result 2019 online on their website and other platforms. Students will be provided the facility to download / take a printout of the CGBSE 10th Result 2019 scorecard form there. But they must remember that CGBSE Result 2019 available online is merely a provisional result. Students are informed by the CGBSE that the online score cards of CGBSE 10th Result 2019 will not be considered as official document. Students should download the CGBSE 10th Result 2019 on their system for only for offline viewing, and to be used as a reference for admission formalities. Authorities will always ask for the original marksheets issued by CGBSE to corroborate the online / printed scorecard before completing their admission formalities. Students are requested to collect the original marksheets for Chhattisgarh Board 10th Result 2019 issued by the Board from their respective schools or examination centres. To clear any doubt or ambiguity among the students regarding the checking and evaluation process, the Chhattisgarh Board will allow students to get their answer sheets rechecked or re-evaluated. During the re-checking process, generally, the Board will get the marks awarded in the answer sheets rechecked and tallied. In case any question has been left unevaluated the same will be evaluated and marks for it will be added to the final tally. Similarly, in the re-evaluation process, the entire answer sheet of the student will be checked by an independent examiner for any errors in the first evaluation. Candidates will have to pay a nominal fee to get their answer sheets rechecked or re-evaluated. The detailed application process, fees and other information will be announced by the Board soon. For those students who have failed in one or more subjects in the CGBSE 10th Result 2019, the CG Board will give them another chance to improve their score without waiting for an entire year. This is through the Improvement / Supplementary / Compartmental Exam. The CGBSE Board will conduct the CGBSE 10th Compartmental Exam for students who have failed in one or more subjects. Such students can reappear for the board exam in the month of June and get their improved results by July 2019. This way, students will be able to seek admission to different Higher Secondary Schools in the stream of their choice without waiting for an entire year. The detailed notification about CGBSE 10th Supplementary Exam will be issued by the board after the declaration of Chhattisgarh Board 10th Result 2019. The CGBSE 10th Result 2017 was announced today. With overall success ratio of 61.04%, the CGBSE 10th Result turned out to be a pleasant surprise for nearly 4.5 lakh students. The Chhattisgarh Board of Secondary Education (CGBSE) declared the Chhattisgarh Board 10th Result 2017 today i.e. 21st April at 9 AM. After the formal declaration, CGBSE Result is now available online on official website cgbse.net. 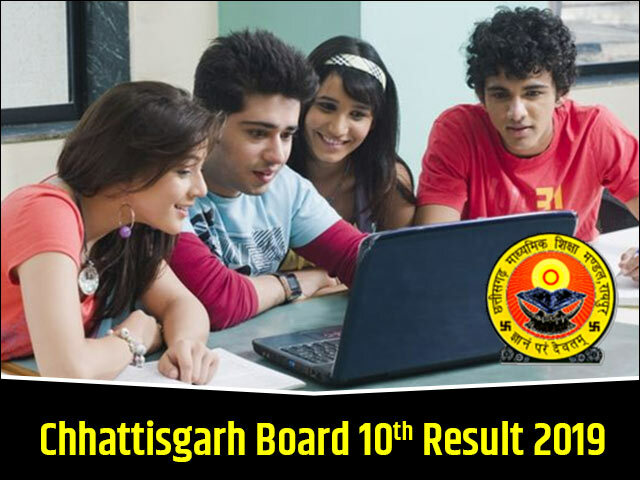 The Chhattisgarh Board of Secondary Education (CGBSE) announced the CGBSE 10th Result. The CGBSE Result is live now and students can check it online at results.cg.nic.in and cgbse.net.